Tis is a beautiful sweater guard with pin backs. 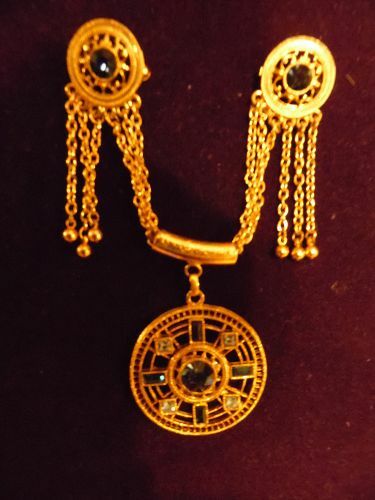 Gorgeous gold tone and set with sapphire and blue topaz set rhinestone embellishments. Looks brand new and is pristine and very well made. 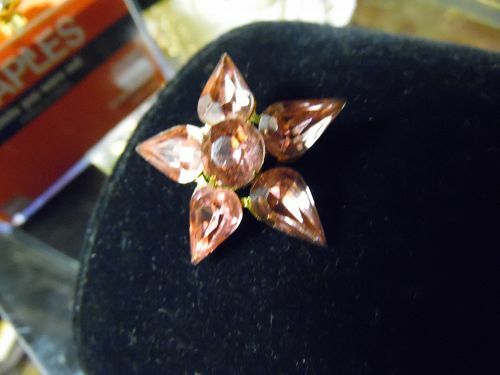 Set of 2 vintage Austrian crystal leaf pins. Delicate gold tone filigree with sparkling aurora borealis crystals studding each leaf. Each leaf measures 2" long. Pristine condition and Marked Made in Austria. 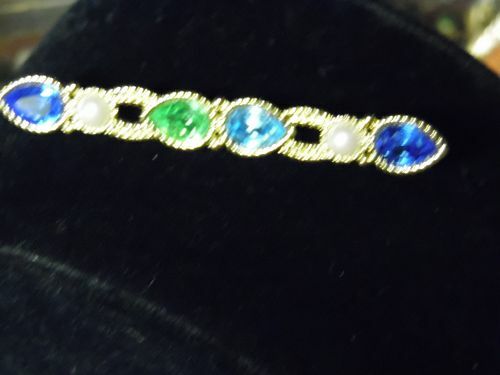 Lovely Monet gold tone bar pin measures 3 1/8" long and has 4 pretty pear shape stones in assorted blues and green, and 2 faux pearls. Marked Monet. Excellent condition. 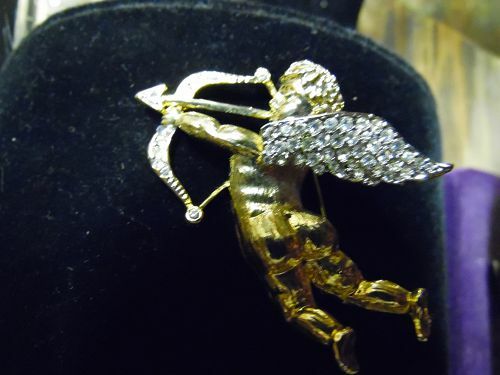 Pretty cupid pin just perfect for Valentine's day. Shiny gold tone encrusted with tiny clear rhinestones on the bow and Cupids wings. Measures approx 1 1/4" tall and 2" long. Pristine condition. 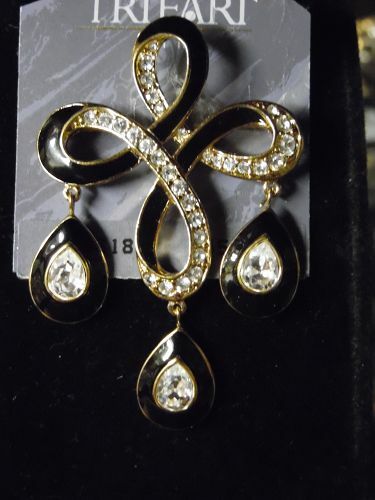 Beautiful vintage Trifari black enamel with clear rhinestone gold tone pin. Measures about 2 6/8 inches long . It is in excellent, never worn condition and marked " Trifari ". Comes on the original card. 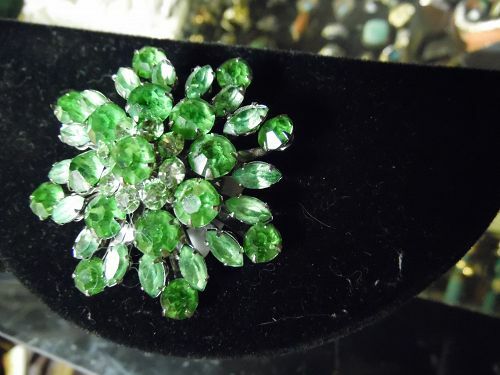 Lovely old Coro pin with clear and peridot green rhinestones. Coro mark circa 1940. Silvertone setting, with a diameter of 2". Very nice condition, with beautiful round stones and marquis stones, forming a pretty snowflake starburst shape. 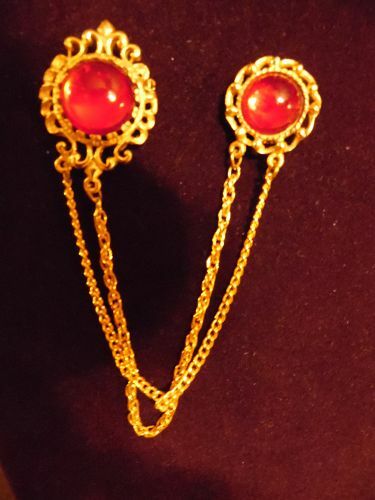 Gorgeous Miriam Haskell stick pin is in great condition and is very pretty. large Amethyst stone surrounded by clear rhinestones, signed Miriam Haskell on the back as shown. Measures about 4 1/4" in length. 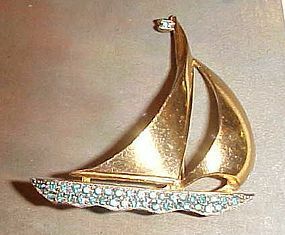 Ahoy there, This is a Wonderful maritime Seafaring Sailboat gold-tone and aqua Rhinestone Brooch with a Double Masted Sloop and Rhinestone Hull Ready to wear with your favorite nautical outfit. 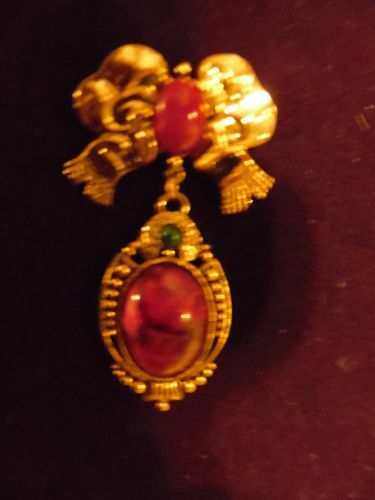 This Dreamy piece has a heavy gold Tone Finish and measures 2 1/2" x 2". 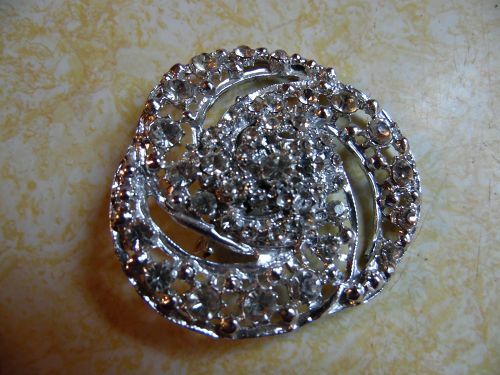 Complete with a Rhinestone Flag, No makers mark but identical to another listed in one of the popular cyber-malls at $272.00 This is a real pretty pin, very collectible, and in wonderful condition. 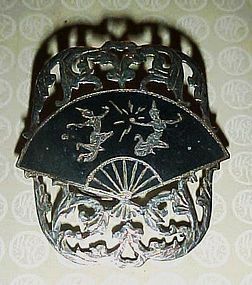 Great vintage pin is simply beautiful. Silvertone set with many tiny little clear stones set with clusters of three pearls per section. Measures 1 3/4" diameter. Like new condition. 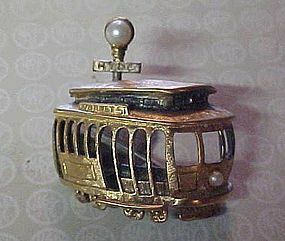 Vintage Tortolani Gold Plated San Francisco Hyde-Market St Trolley Car with faux Pearls pin. 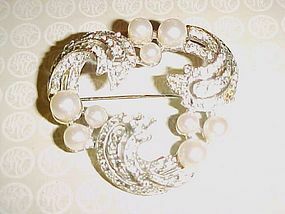 The brooch measures about 1 3/8 " x 1 1/2 " Is in very nice vintage condition. It is marked (C)Tortolani which shows it is an older piece. 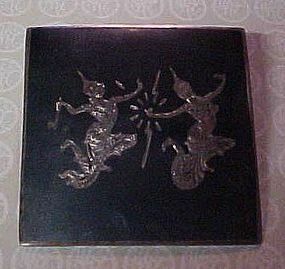 Beautiful old sterling silver pin with two Siamese lady dancers. Measures approx 1 5/8 x 1 5/8". Excellent condition and marked made in Siam Sterling. 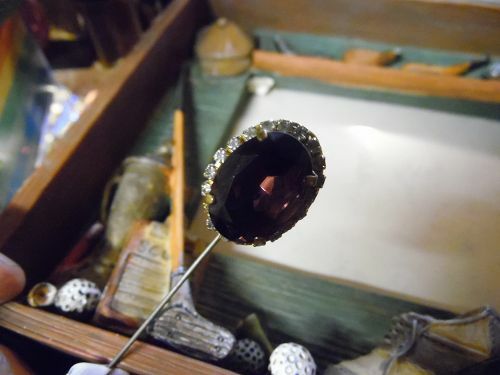 This wonderful pin is a cluster of tiny clear crystal stones closely prong set in a silvertone setting. THe loop of the pin is raised and creates a pretty 3-d effect. Measures 2" tall and 1 1/2" wide and rises 1" at the tallest point. Excellent condition but is unsigned. 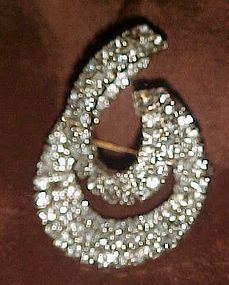 The crystals sparkle like diamonds. A very classy and elegant pin. All stones intact and safety clasp works well.